It can be a little hard to spot Ogi Custom Furniture and Designs from the corner of Main and Wellons streets in downtown Four Oaks. The building still has a Pepsi-Cola ad painted on the side you can see from the stoplight. That&apos;s a decent landmark to guide visitors to the shop, but the bear out in front is a better one. 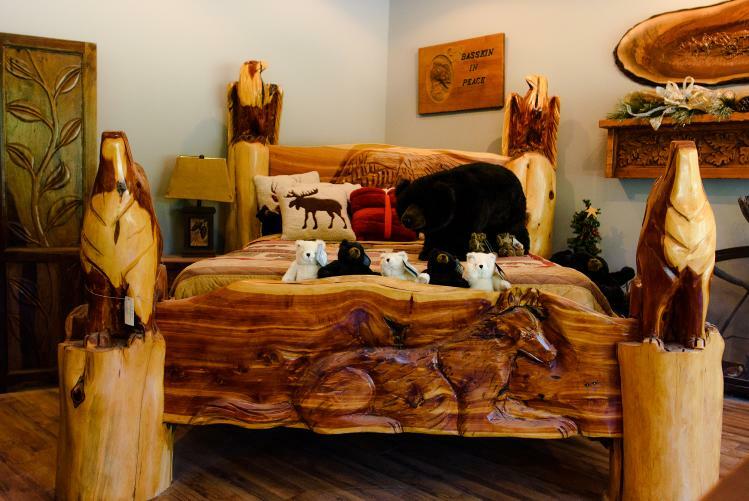 “When the bear is out, I&apos;m here,” owner Michael Pritchett said. By the time a visitor is close enough to the front door to see the aforementioned bear, who&apos;s wearing a Hawaiian shirt and black sunglasses on a summer morning, it becomes easier to tell that an artisan&apos;s workshop is near. The smell of freshly cut wood wafts out the door and onto the street, and once inside, the fruits of Pritchett&apos;s labors are on full display. There&apos;s a bar straight ahead, where the bear sits when it&apos;s raining, with an intricate design carved on the front. There are beautiful tables, bookshelves and a striking bed in the corner that must have taken ages, and a great deal of patience, to make. There&apos;s a small bear sitting on a ledge near the ceiling, which gives one the impression that there might be a story there. Michael started Ogi in 2008 while he was still running his other company, MDN Cabinets. 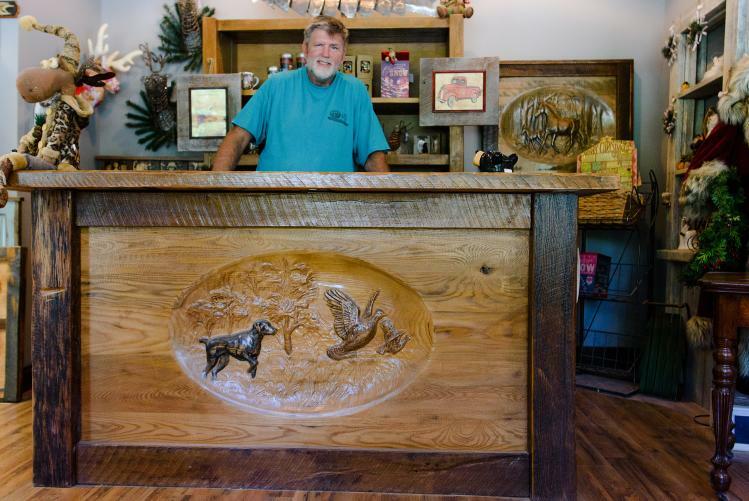 He sold MDN Cabinets for good in 2012, and in the past few years, he and his wife, Joan, have focused solely on Ogi. While there is still office work to be done, Pritchett gets to spend plenty of time in his workshop. 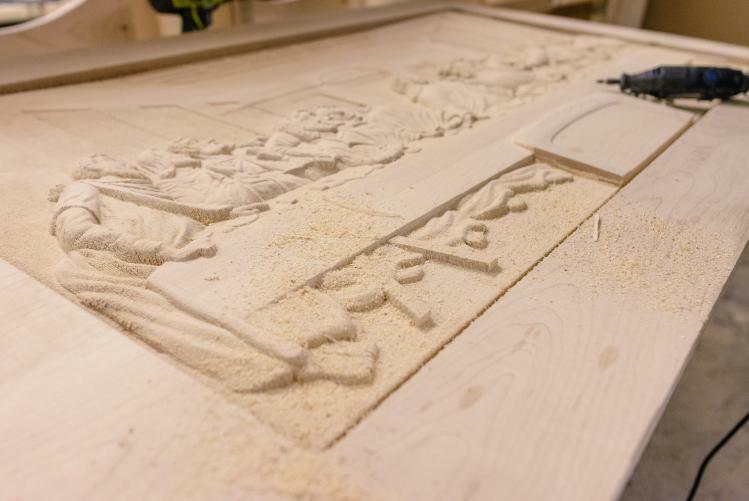 Those dreams include a 50-foot wide and 22-foot tall menorah out of walnut and maple. Pritchett found another interesting project a little closer to home. “A lady in Benson took over a ham curing plant and made it her house,” he said. “The old ham racks that they&apos;d hang ham on, they asked me if I wanted the wood off them. … I went down there and they were covered in black fat. Fifty years worth of salt and fat. Just nasty, nasty stuff. But I said I would take it, so I started taking the racks apart. That led to him building her a coffee table, two end tables and a desk out of an old pump organ from the 1800s that she found in an old barn. If you know his whole story, however, that sentiment is packed with some irony. It seems woodworking wasn&apos;t exactly his first love growing up in Indiana. He went to college and studied to become a diesel mechanic on farm equipment, but found that he could “put more food on the table” making cabinets and furniture. He moved to North Carolina in search of more work to do, and found plenty. These days, when he&apos;s not tearing down barns and houses and transforming 100-year-old pieces of wood into new furniture, he&apos;s repairing and refinishing existing pieces. “People bring me stuff in baskets,” he said. Whether it&apos;s a new creation or returning a piece to its former glory, folks can just look for the bear. Want to learn more about Ogi Custom Furniture and Designs? Visit them on the web at ogifurniture.com, stop by the shop at 206 South Main St., Four Oaks or call 919-963-3090.